Note: the name of the macro may change before the release of v2.10. The File > Send by email… dialog will open your default email client with an attached copy of the current image, to share your work-in-progress with a single click. This is available only on operating systems with xdg-email (likely GNU/Linux, BSD only). The original implementation using sendmail is also available. Yet since it requires a properly configured sendmail, which is not common on desktop machines, the explicit --with-sendmail option has to be set at build time to replace the xdg-email implementation. In the unlikely event that GIMP crashes, we need as much information as possible to find out the actual bug. The raw crash log is one such source of information. Windows builds can now generate backtrace logs upon a crash with Dr.MinGW’s ExcHndl library, which must be available at build time. The logs will be stored in %APPDATA%\GIMP\2.9\CrashLog\. Since the release of v2.9.2 we have been mostly fixing bugs and completing the work we had started earlier. We are not planning to add any major new features in v2.10. If you are interested in helping us release v2.10 earlier, you can find the list of bug reports in our bugtracker. GIMP 2.9.2 was released on November 27, 2015. Since then, the work to reach GIMP 2.9.4 was done in 1348 commits, making an average of 5.9 commits a day, of which 894 are (mostly) code-related, 241 are icon-related, and 213 are translation updates. As usual, the GIMP team is small yet as dedicated as ever: more than a third of the commits have been done by Michael Natterer (514), the next biggest contributors being Jehan Pagès (192) and Klaus Staedtler (187). The three of them represent 66% of all commits. Tobias Ellinghaus, a darktable developer, contributed 14 commits on darktable integration and improving EXR and PNM support. Of course, we also have our usual suspects with 10+ code commits: Alexandre Prokoudine, Daniel Sabo, Kristian Rietveld, Massimo Valentini, and Michael Henning. And since no patch is too small, it would be completely unfair to forget all other code contributors: Adrian Likins, A S Alam, Carol Spears, Eugene Kuligin, Jasper Krijgsman, João S. O. Bueno, nmat, Richard Kreckel, saul, Shmuel H, Jonathan Tait, Michael Schumacher, Pedro Gimeno, Richard Hughes, Benoit Touchette, Hartmut Kuhse, Kevin Cozens, Elle Stone, Mukund Sivaraman, Øyvind Kolås, Sven Claussner, Thomas Manni, Alexia Death, Andrew Worsley, Simon Budig, and Piotr Drąg. New icons are a big work in progress, with 241 commits, mostly by Klaus Staedtler, with additional contributions from Aryeom Han, Benoit Touchette, Jehan, Kevin Payne, Michael Natterer and Øyvind Kolås. We should not forget Benoit Touchette for his work in progress on themes, as well as some code contribution. We would like to thank as well every 30 translators: Alexandre Prokoudine, Ask Hjorth Larsen, Balázs Meskó, Balázs Úr, Christian Kirbach, Cédric Valmary, Daniel Korostil, Daniel Mustieles, Dimitris Spingos, Dušan Kazik, Gábor Kelemen, Hartmut Kuhse, J.M. Ruetter, Jordi Mas, Khaled Hosny, Marco Ciampa, Mario Blättermann, Martin Srebotnjak, Mónica Canizo, Necdet Yücel, Pedro Albuquerque, Piotr Drąg, Rūdolfs Mazurs, Sebastian Rasmussen, Sveinn í Felli, Tiago Santos, Yolanda Álvarez Pérez, Klaus Staedtler, kolbjoern, and Милош Поповић. Note: Statistics based on the number of commits provide valuable information regarding the activity of a project, yet they are not always a perfect indicator of contribution, so the goal of this section is not to have any kind of contributor rank. For instance, one commit could be a one-liner, whereas another could contain several hundreds of lines (and even this may not always be a good indicator of the time spent on and the difficulty of the fix). We sincerely hope we did not forget anyone, and we want to say: thank you. The source code is available from the Downloads page. An installer for Windows will be available shortly. A build for Mac OS X is not available at this time. This week the GIMP project celebrates its 20th anniversary. Back in 1995, University of California students, Peter Mattis and Spencer Kimball, were members of the eXperimental Computing Facility, a Berkeley campus organization of undergraduate students enthusiastic about computers and programming. In June of that year, the two hinted at their intentions to write a free graphical image manipulation program as a means of giving back to the free software community. On November 21st, 20 years ago today, Peter Mattis announced the availability of the “General Image Manipulation Program” on Usenet (later on, the acronym would be redefined to stand for the “GNU Image Manipulation Program”). Since its public release the project has been evolving in many ways as a testbed for new ideas, which was considerably assisted by adding plug-in architecture. Over the years, GIMP amassed a huge amount of new features designed for all kinds of users and practical applications: general image editing, retouching and color grading, digital painting, graphic design, science imaging etc. Between 2006 and 2012, the team collaborated with Peter Sikking of man+machine works to define product vision and improve user experience. Thanks to this collaboration GIMP’s user interface has become more conventional for professional users, and various tools have become more powerful and easy to use. But more importantly, we got a much better idea how to design good interfaces. In the past several years we’ve been working hard on porting GIMP to a newer image processing engine called GEGL. The switch to GEGL made us rewrite or at least tweak pretty much every part of GIMP’s source code. Fortunately, this work is nearing completion, and you’ll soon be able to benefit from all the changes that it’s bringing. 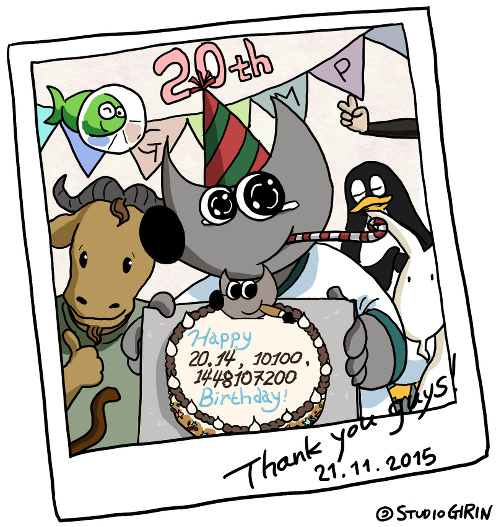 To celebrate the 20th anniversary, we released an update of the current stable version of GIMP. Newly released GIMP 2.8.16 features support for layer groups in OpenRaster files, fixes for layer groups support in PSD, various user inrterface improvements, OSX build system fixes, translation updates, and more changes. Our immediate future plans are to release first public version in the unstable 2.9.x series that will feature fully functional GEGL port, 16/32bit per channel processing, basic OpenEXR support, vastly improved color management implementation, new tools, on-canvas preview for many filters, and more. This release will encompass over three years of work and become the first milestone towards 2.10. Following v2.10 release, we shall complete the GTK+3 port that is required to bring back state of the art Wacom support for Windows users. When it’s done and GIMP 3.0 is out, we shall finally be able to get started on some very exciting and much anticipated features like non-destructive editing. Please refer to Roadmap for more details. In conjunction with the 20th anniversary we have updated and revamped the website. The vast majority of the work on the new website was done by Pat David. The update (finally) includes some much needed improvements such as news items with permalinks and full RSS/Atom feeds. The site is also now responsive to adapt to various screen sizes. Try it on a mobile device or tablet! Wilber & Co. comics courtesy of Aryeom & Jehan. The tons of links on the web pointing to the former site made keeping the installers there as well a necessity, though, and since SF claimed that our outrage over their “installer with benefits” was based on a misunderstanding, this seemed to be a low-risk approach. However we are receiving reports that people who get there by chance receive small installers that include additional software. And it’s no clicks on those ‘big green download arrow’ ads this time, we’ve tried ourselves. SF has not responded to our inquiry yet, and we found that the maintainer of the GIMP for Windows installers is locked out of that SF project now. And now SF is launching an attempt at damage control. Ars Technica has a nice summary, with insightful comments. Please go to our own downloads page to get the GIMP for Windows installers. We do not want our users having to dodge any “offers” or to worry about possibly installing malware in the process. With our shared history, it was painful to watch the invasion of the big green “Download” button ads appearing on the SourceForge site. Our decision to move the Windows installers away from SourceForge in 2013 was a direct result of how its service degraded in this respect. We don’t believe that this is a fixable situation. However, if SourceForge’s current management are willing to collaborate with us on these matters, then there might be a reduction in the damage and feeling of betrayal among the Free and Open Source Software communities. We noticed that gimpguru.org, once the host of GIMP tutorials (some of which are also present in our Tutorials section) has been abandoned by its original owner and is redirecting visitors to some very suspicious downloads—don’t go there. We have removed all links pointing there from the tutorials (please do tell if we missed one), and caution everyone to only consider links on our own downloads page and the sites linked from there. Special announcement for domain owners: if you own a domain with gimp in its name and host a forum or something else, and don’t feel like you want to continue to do so or renew it some day, please approach us – we’d rather take it over ourselves and have it point to www.gimp.org than see it being abused like that. It’s been a while since the last release. Quite a few bug-fixes have piled up in the stable branch, so here’s another release in the stable GIMP 2.6 series. Please have a look at the NEWS file for a detailed list of changes. The source can be downloaded from ftp.gimp.org. Binary packages for various supported platforms should become available soon; please check the Downloads section.